Communication takes place only when someone is heard and understood. When people cannot hear each other properly in a meeting, productivity and relationships can be jeopardized. Today, technological solutions are available to create acoustical environments that make it easier for teams to connect and exchange ideas. In this interview, Steve Ellison, Meyer Sound's applications director for digital products, explains how Constellation not only enhances communication in live performance applications, restaurants, and hospitality environments, but also in meetings and presentations in corporate settings. The benefits of Constellation in music applications are well known. How does Constellation work in a corporate AV environment? Constellation is a system designed to acoustically transform a room from one use to another with the press of a button. In a multi-purpose room, the use may range from drama to choral music. In a corporate AV environment, the use may range from video playback, teleconferencing, lectures, presentations, and Q&A, to small break-out sessions. Constellation can provide settings that adapt a room's acoustics for each of these different demands. Voice directivity chart showing the relative sound levels in the different vertical directions. In general, what are the audio considerations in corporate applications? Whether it is for a gathering at a boardroom table or a meeting with classroom-style seating, the goal is to make sure that the talkers are heard properly and the participants are engaged. In some meetings, the talker may rely on a handheld, lavalier, or lectern microphone with a PA system, which presents its own challenges. If teleconferencing is involved, then those on the other line have to hear and be heard as well. In what ways does the traditional setup with microphone and PA become problematic? If presenters are at a lectern, when they turn away from the mic towards the screen, their voice may get lost. Lavalier microphones are inconvenient, from the transmitter packs and the maintenance support that goes along with it. In Q&A sessions, handheld microphones that are passed around can inhibit the flow of a conversation. Often, audience questions just don't get heard by people sitting in the back of the room. If a room is mainly used for teleconferencing, meetings, and video playback, why does it need variability in its acoustics? Can't a non-reverberant room do it all? For unamplified speech in a non-reverberant space, you rely on the directivity between two individuals to maximize the communication. This means if you turn away from your audience to face a display or a whiteboard, they may not hear you very well. In a typical meeting room, it's highly unlikely for the talker to face each listener in a room directly. Also, by definition, acoustic absorption reduces the energy and strength. Less strength means less signal and less support to the unamplified human voice. That's why no classroom is designed to be an anechoic chamber, otherwise, occupants can feel extremely isolated and it can be very uncomfortable for talking. The "acoustic intimacy" that benefits musicians applies to speech as well. On the other hand, teleconferencing and video playback require a room with almost no reverberation. The human voice needs more strength from the room acoustics for support. How does Constellation provide a better solution for speech? Starting with a dead room, Constellation adds those very useful early reflections from signals captured by microphones in one or several parts of the room and reproduces them using loudspeakers in other areas. Depending on the function, this can create one-way or multi-directional acoustic energy paths. For instance, a "Presentation" setting uses microphones near the presenter and reproduces those signals in the audience area. A "Q&A" setting picks up signals from microphones over the audience to create signals in loudspeakers all around the room, at different levels. This makes it easier for people in the back of the room to hear questions from those in the front. Nobody has to bother with microphones or mixing. Just press a button and go. And if a room might be used for an occasional hospitality event, we can use the same components to create a more lively acoustic atmosphere more appropriate for a party. How is designing a Constellation system for live music different from Constellation for speech? The most significant difference is that while Constellation for music focuses on the reverberation time, Constellation for speech focuses on strength and early reflections. Increasing the amount of early reflections can produce the same benefit as increasing the strength of the direct sound. Constellation electroacoustically adds these early reflections, and provides control for their strength, length, density, frequency response, and direction of propagation in a room. Once calibrated, the end user optimizes the acoustics for the event using a simple control interface. You can read more about the benefits of early reflections in this AES paper. 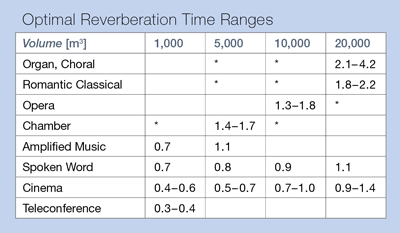 The optimal reverberation time varies depending on the programming material. Can loudspeakers and microphones in a Constellation system used primarily for voice lift double as part of a teleconferencing system? Yes, Constellation can integrate with third-party teleconferencing systems. Constellation microphones can pick up discussions in the room while the loudspeakers broadcast the signals from the callers on the line. The loudspeakers can also support video presentations and movies on displays if needed. In corporate applications, multi-manufacturer network integration is key, and Constellation certainly supports that. With the AVB support of our D-Mitri digital audio platform—which serves as the backbone behind Constellation—integration in future projects will be seamless. How mobile is the system? Can an AV company rent it out as a portable system to corporate clients? No. Each system is customized for the given space. That's why you can't transfer the equipment to a different room without going through a new design and calibration process. Is there a recent trend that has encouraged the market demand for Constellation in meeting spaces? We want technology that is transparent. Whether it is an iPhone controlling your AV system at home or Constellation settings on a touch screen to transform room acoustics, we want it to be as simple as flipping a light switch. Also, we want solutions that help us feel more connected, regardless of whether we are in the same meeting room or collaborating remotely. Since 1979 Meyer Sound has been a world leader in the design and manufacture of professional audio equipment by remaining true to its core values of making the very best products and providing personalized customer support. To this day, Meyer Sound is privately owned and operated by founders John and Helen Meyer. At our Berkeley, Calif., factory headquarters we design and manufacture fully integrated sound reinforcement systems including premium professional loudspeakers, digital audio systems, electroacoustic architecture, and acoustical prediction software. The company has an international focus, with distributors around the globe and branch offices in Nashville, Canada, Russia, Germany, and Mexico. Meyer Sound also is active in its local community, supporting performing arts groups like Berkeley Rep, CalPerformances, and ACT, as well as advanced research with UC Berkeley.